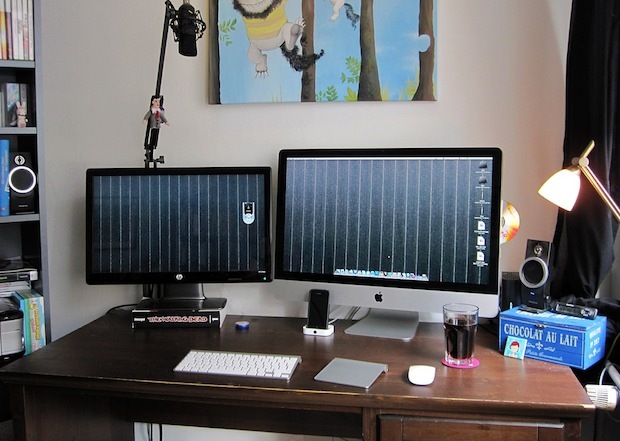 A 27″ iMac always makes for a great desktop. This one is a Core i5 with an SSD, and an external HP 23″ display is attached to extend the screen real estate even further. I am so accustomed to using a Mac with an additional screen that it would be almost impossible to have a workstation without one, plus they always make for awesome looking Mac setups. If you’re not using an additional display, you’re missing out on a major productivity boost. Why would two screens be better than one? Who needs more than 512k RAM? Why not have an array of ten screens? Why stop at two? You know what’s better than an extra monitor? A numpad on your keyboard. Yeah because a num pad is used so much these days. Actually, “Har Har”, I use a wired keyboard specifically because I want and use the numeric keypad regularly. Just because you don’t doesn’t mean that no one does.